Primary eosinophilic esophagitis (EoE) is an emerging clinicopathologic entity that is characterized clinically by symptoms related to esophageal dysfunction and histologically by an eosinophil-rich inflammation that is limited to the esophagus. Subsequently, as the understanding of EoE evolved, a phenotypic heterogeneity in disease presentation was observed, such as PPI-responsive esophageal eosinophilia. 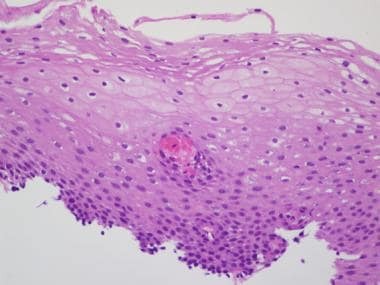 Furthermore, the practical usefulness of the histological criteria was observed to be limited, as the presence of 15 or more eosinophils/hpf on esophageal biopsy samples could not be validated to successfully discriminate among various causes of esophageal eosinophilia, such as GERD, infections, Crohn disease, and hypersensitivity, among others. All of these factors led to a need to review the 2007 recommendations. The first case of eosinophilic esophagitis (EoE) was reported in 1977 in an adult patient;  however, it was not until the 1990s that it came to be recognized as a distinct clinical entity. In 1993, Attwood et al reported first case series of EoE in 12 adult patients and suggested that this is an entity distinct from GERD. Subsequently, Kelly et al  reported a case series of 10 pediatric patients with eosinophilic infiltration of the esophagus whose gastrointestinal symptoms were unresponsive to standard antireflux treatment but improved with and amino acid–based formula diet. Since then, there has been an implosion of published literature on EoE. In 2005, Straumann and Simon  reported an average incidence of 1.438 cases of EoE per 100,000 inhabitants over a 16-year observational period in Olten County, Switzerland. They noted a marked increase in newly diagnosed cases in later years. Since EoE is a chronic condition, this increased incidence reflected an increased prevalence. The authors of this study also suggested that the trend reflects a true increase in incidence and not just increased awareness. Subsequently, Hruz et al,  in another demographic study from Olten county in Switzerland, reported an increased incidence in 6 years from 4.4-7.4 per 100,000 inhabitants per year and a prevalence of 43 patients with EoE per 100,000 inhabitants. This study in included both the pediatric and adult population. Similarly, in a study from western Australia,  an increasing trend in prevalence was observed in the pediatric population over a decade, from 0.05 to 0.89 per 10,000 children. Ronkainen et al  reported a prevalence of 1% EoE in the adult Swedish population. In the United States, a pediatric population–based demographic study from Hamilton County in Ohio reported an annual incidence of EoE of 1 per 10,000 and a prevalence of 4.296 cases per 10,000 children. Prasad et al,  in a retrospective study on epidemiologic trends of EoE in Olmsted county, Minnesota, reported an increasing incidence of EoE in three decades: 0.86 cases/100,000 population/year from 1976 to 1985 to 8.78 cases/100,000 population/year from 1996-2006. The prevalence of EoE, in this study, was reported to be 104.7 cases/100,000 population as of January 2007. Sorser et al  reported no increase in the incidence of EoE in their cohort of pediatric population over a period of 5 years from 2001-2006. An increased prevalence of EoE has been observed in patients with celiac disease. [17, 18] An inverse relationship has been reported between the prevalence of Helicobacter pylori infection and esophageal eosinophilia. Climate has been found to affect EoE prevalence. A recent study by Hurrell et al  reported that EoE is most prevalent in the cold and arid zones. Another study demonstrated that delivery of another Th2 cytokine interleukin 13 (IL-13) to lungs induces EoE by inducing IL-5, eotaxin-1, through signal transducer and activation of a transcription (STAT)–6 dependent mechanism. The results of this study established a link between lung and esophageal inflammation and suggested that direct exposure of esophageal mucosa to an allergen is not necessary for EoE to develop. An in vitro study involving human esophageal mucosal tissue by Straumann et al  demonstrated that EoE induces a selective inflammatory response restricted to the esophagus and includes infiltration of esophageal mucosa by IL-5 expressing T-cells, B-cells, and eosinophils and immunoglobulin E (IgE) expressing mast cells. This landmark study provided scientific evidence for an atopic/allergenic basis of EoE. In 2006, Blanchard et al  demonstrated eotaxin-3 as a critical effector molecule for EoE by gene expression profiling. Later, in an attempt to characterize the cytokine expression in EoE, they reported significantly increased esophageal expression of interleukin 4 (IL-4) and IL-5 mRNA in patients with active EoE. They also provided further evidence in their study that IL-13 and IL-5 associate with eosinophil and eotaxin-3 levels in patients with EoE, thereby indicating the key role of adaptive T(H)2 immunity in regulating eotaxin-3–driven esophageal eosinophilia in the absence of a consistent systemic change in cytokines. 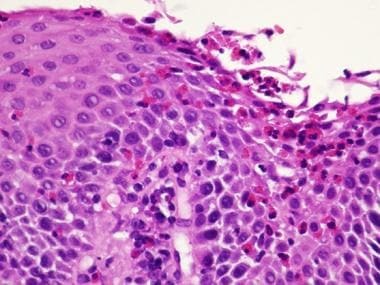 Primary eosinophilic esophagitis (EoE) is a disease unique to the esophagus, with esophageal eosinophilia limited to the esophagus and involving both the proximal and distal esophagus. Primary eosinophilic esophagitis (EoE) affects all ethnic groups and both sexes. There is a slight male predominance, with a male-to-female ratio of 3:1. It is a disease of both children and adults. Generally, the clinical symptoms of EoE are nonspecific, and the patients are in good physical condition; therefore, in some cases, the diagnosis of EoE is made a few years after onset of symptoms. In a 2012 study, Sorser et al  reported vomiting as the most common presenting symptom in children and adolescents (61%), followed by dysphagia (39%), abdominal pain (34%), feeding disorders (14%), heartburn (14%), food impaction (7%), vague chest pain (5%), and diarrhea (5%). They further noted that vomiting and feeding disorders affected younger children, whereas heartburn and dysphagia occurred in older children. 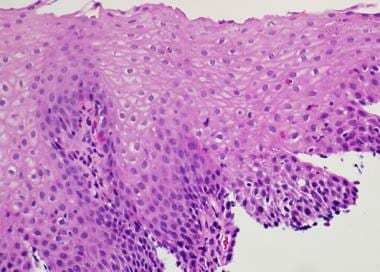 The normal histology of esophageal mucosa shows a nonkeratinizing stratified squamous epithelium, lamina propria, and muscularis mucosae. The basal cell layer is 1-3 cell layers thick and occupies about 10%-15% of the epithelium. The vascular papillae, which are extensions of lamina propria, extend less than two thirds of the distance from base to surface. Among inflammatory cells, intraepithelial lymphocytes are a normal component of esophageal squamous mucosa. However, eosinophils are not normally seen in esophageal squamous mucosa. Subsequently, the updated recommendations for diagnosis of EoE, published in 2011, stated no change in the threshold number of 15 eosinophils/hpf. This was based on the observation that, since the 2007 consensus recommendations, no studies have identified a clear ‘‘lower limit of esophageal eosinophilia’’ or threshold number that would define EoE or have identified other histologic features or pattern of disease distribution that are pathognomonic of EoE. The presence of erosion, ulceration, and neutrophils are not features of EoE and favor an alternate cause such as reflux esophagitis, infections, or drug-related mucosal damage. 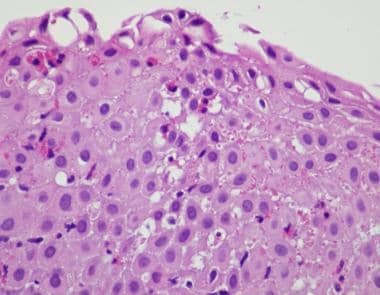 Immunohistochemistry does not play a major role in the diagnosis of eosinophilic esophagitis (EoE), since the predominant inflammatory cell type is an eosinophil, which is easily recognized on hematoxylin and eosin–stained sections. Hence, the recommended diagnostic histological criterion of at least 15 eosinophils/hpf is based on hematoxylin and eosin–stained sections. The main differential diagnosis of eosinophilic esophagitis (EoE) is reflux esophagitis. Other differential diagnoses include primary eosinophilic gastroenteritis. This is histological manifestation of GERD that causes esophageal mucosal damage by passive backflow of gastric contents into the distal esophagus. There is considerable histological overlap between reflux esophagitis and EoE. 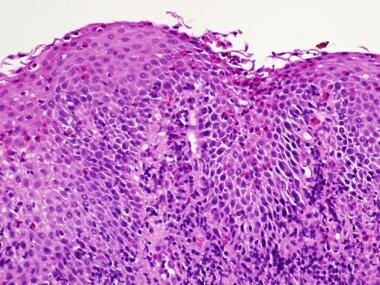 Typically, histological features of reflux esophagitis include mild to moderate basal cell hyperplasia, elongation of vascular papillae, dilated intercellular spaces, increased intraepithelial lymphocytosis, and the presence of intraepithelial eosinophils that number less than 5-7/hpf. The main differential diagnosis is reflux esophagitis. Other differential diagnosis includes primary eosinophilic gastroenteritis. [Guideline] Furuta GT, Liacouras CA, Collins MH, Gupta SK, Justinich C, Putnam PE. Eosinophilic esophagitis in children and adults: a systematic review and consensus recommendations for diagnosis and treatment. Gastroenterology. 2007 Oct. 133(4):1342-63. [Medline]. [Guideline] Liacouras CA, Furuta GT, Hirano I, Atkins D, Attwood SE, Bonis PA. Eosinophilic esophagitis: updated consensus recommendations for children and adults. J Allergy Clin Immunol. 2011 Jul. 128(1):3-20.e6; quiz 21-2. [Medline]. [Guideline] Papadopoulou A, Koletzko S, Heuschkel R, et al, ESPGHAN Eosinophilic Esophagitis Working Group and the Gastroenterology Committee. Management guidelines of eosinophilic esophagitis in childhood. J Pediatr Gastroenterol Nutr. 2014 Jan. 58 (1):107-18. [Medline]. Dobbins JW, Sheahan DG, Behar J. Eosinophilic gastroenteritis with esophageal involvement. Gastroenterology. 1977 Jun. 72(6):1312-6. [Medline]. Attwood SE, Smyrk TC, Demeester TR, Jones JB. Esophageal eosinophilia with dysphagia. A distinct clinicopathologic syndrome. Dig Dis Sci. 1993 Jan. 38(1):109-16. [Medline]. Kelly KJ, Lazenby AJ, Rowe PC, Yardley JH, Perman JA, Sampson HA. Eosinophilic esophagitis attributed to gastroesophageal reflux: improvement with an amino acid-based formula. Gastroenterology. 1995 Nov. 109(5):1503-12. [Medline]. Schoepfer AM, Simon D, Straumann A. Eosinophilic oesophagitis: latest intelligence. Clin Exp Allergy. 2011 May. 41(5):630-9. [Medline]. Prasad GA, Alexander JA, Schleck CD, Zinsmeister AR, Smyrk TC, Elias RM. Epidemiology of eosinophilic esophagitis over three decades in Olmsted County, Minnesota. Clin Gastroenterol Hepatol. 2009 Oct. 7(10):1055-61. [Medline]. Remedios M, Jones D, Kerlin P. Eosinophilic oesophagitis: epidemiology, pathogenesis and management. Drugs. 2011 Mar 26. 71(5):527-40. [Medline]. Straumann A, Simon HU. Eosinophilic esophagitis: escalating epidemiology?. J Allergy Clin Immunol. 2005 Feb. 115(2):418-9. [Medline]. Hruz P, Straumann A, Bussmann C, Heer P, Simon HU, Zwahlen M. Escalating incidence of eosinophilic esophagitis: a 20-year prospective, population-based study in Olten County, Switzerland. J Allergy Clin Immunol. 2011 Dec. 128(6):1349-1350.e5. [Medline]. Cherian S, Smith NM, Forbes DA. Rapidly increasing prevalence of eosinophilic oesophagitis in Western Australia. Arch Dis Child. 2006 Dec. 91(12):1000-4. [Medline]. Ronkainen J, Talley NJ, Aro P, Storskrubb T, Johansson SE, Lind T. Prevalence of oesophageal eosinophils and eosinophilic oesophagitis in adults: the population-based Kalixanda study. Gut. 2007 May. 56(5):615-20. [Medline]. Noel RJ, Putnam PE, Rothenberg ME. Eosinophilic esophagitis. N Engl J Med. 2004 Aug 26. 351(9):940-1. [Medline]. Sorser SA, Barawi M, Hagglund K, Almojaned M, Lyons H. Eosinophilic esophagitis in children and adolescents: epidemiology, clinical presentation and seasonal variation. J Gastroenterol. 2012 May 23. [Medline]. Straumann A, Aceves SS, Blanchard C, Collins MH, Furuta GT, Hirano I. Pediatric and adult eosinophilic esophagitis: similarities and differences. Allergy. 2012 Apr. 67(4):477-90. [Medline]. Leslie C, Mews C, Charles A, Ravikumara M. Celiac disease and eosinophilic esophagitis: a true association. J Pediatr Gastroenterol Nutr. 2010 Apr. 50(4):397-9. [Medline]. Thompson JS, Lebwohl B, Reilly NR, Talley NJ, Bhagat G, Green PH. Increased incidence of eosinophilic esophagitis in children and adults with celiac disease. J Clin Gastroenterol. 2012 Jan. 46(1):e6-e11. [Medline]. Dellon ES, Peery AF, Shaheen NJ, Morgan DR, Hurrell JM, Lash RH. Inverse association of esophageal eosinophilia with Helicobacter pylori based on analysis of a US pathology database. Gastroenterology. 2011 Nov. 141(5):1586-92. [Medline]. Hurrell JM, Genta RM, Dellon ES. Prevalence of esophageal eosinophilia varies by climate zone in the United States. Am J Gastroenterol. 2012 May. 107(5):698-706. [Medline]. Wang FY, Gupta SK, Fitzgerald JF. Is there a seasonal variation in the incidence or intensity of allergic eosinophilic esophagitis in newly diagnosed children?. J Clin Gastroenterol. 2007 May-Jun. 41(5):451-3. [Medline]. Almansa C, Krishna M, Buchner AM, Ghabril MS, Talley N, DeVault KR. Seasonal distribution in newly diagnosed cases of eosinophilic esophagitis in adults. Am J Gastroenterol. 2009 Apr. 104(4):828-33. [Medline]. Mishra A, Hogan SP, Lee JJ, Foster PS, Rothenberg ME. Fundamental signals that regulate eosinophil homing to the gastrointestinal tract. J Clin Invest. 1999 Jun. 103(12):1719-27. [Medline]. Mishra A, Hogan SP, Brandt EB, Rothenberg ME. IL-5 promotes eosinophil trafficking to the esophagus. J Immunol. 2002 Mar 1. 168(5):2464-9. [Medline]. Mishra A, Rothenberg ME. Intratracheal IL-13 induces eosinophilic esophagitis by an IL-5, eotaxin-1, and STAT6-dependent mechanism. Gastroenterology. 2003 Nov. 125(5):1419-27. [Medline]. Straumann A, Bauer M, Fischer B, Blaser K, Simon HU. Idiopathic eosinophilic esophagitis is associated with a T(H)2-type allergic inflammatory response. J Allergy Clin Immunol. 2001 Dec. 108(6):954-61. [Medline]. Blanchard C, Wang N, Stringer KF, Mishra A, Fulkerson PC, Abonia JP. Eotaxin-3 and a uniquely conserved gene-expression profile in eosinophilic esophagitis. J Clin Invest. 2006 Feb. 116(2):536-47. [Medline]. Carr S, Watson W. Eosinophilic esophagitis. Allergy Asthma Clin Immunol. 2011. 7 Suppl 1:S8. [Medline]. Rothenberg ME, Mishra A, Collins MH, Putnam PE. Pathogenesis and clinical features of eosinophilic esophagitis. J Allergy Clin Immunol. 2001 Dec. 108(6):891-4. [Medline]. Spergel JM, Beausoleil JL, Mascarenhas M, Liacouras CA. The use of skin prick tests and patch tests to identify causative foods in eosinophilic esophagitis. J Allergy Clin Immunol. 2002 Feb. 109(2):363-8. [Medline]. Simon D, Marti H, Heer P, Simon HU, Braathen LR, Straumann A. Eosinophilic esophagitis is frequently associated with IgE-mediated allergic airway diseases. J Allergy Clin Immunol. 2005 May. 115(5):1090-2. [Medline]. Tai PC, Ackerman SJ, Spry CJ, Dunnette S, Olsen EG, Gleich GJ. Deposits of eosinophil granule proteins in cardiac tissues of patients with eosinophilic endomyocardial disease. Lancet. 1987 Mar 21. 1(8534):643-7. [Medline]. Kay AB, Phipps S, Robinson DS. A role for eosinophils in airway remodelling in asthma. Trends Immunol. 2004 Sep. 25(9):477-82. [Medline]. Meyer GW. Eosinophilic esophagitis in a father and a daughter. Gastrointest Endosc. 2005 Jun. 61(7):932. [Medline]. Patel SM, Falchuk KR. Three brothers with dysphagia caused by eosinophilic esophagitis. Gastrointest Endosc. 2005 Jan. 61(1):165-7. [Medline]. Straumann A. The natural history and complications of eosinophilic esophagitis. Thorac Surg Clin. 2011 Nov. 21(4):575-87. [Medline]. Binkovitz LA, Lorenz EA, Di Lorenzo C, Kahwash S. Pediatric eosinophilic esophagitis: radiologic findings with pathologic correlation. Pediatr Radiol. 2010 May. 40(5):714-9. [Medline]. Heine RG, Nethercote M, Rosenbaum J, Allen KJ. Emerging management concepts for eosinophilic esophagitis in children. J Gastroenterol Hepatol. 2011 Jul. 26(7):1106-13. [Medline]. Gupte AR, Draganov PV. Eosinophilic esophagitis. World J Gastroenterol. 2009 Jan 7. 15(1):17-24. [Medline]. Hurrell JM, Genta RM, Melton SD. 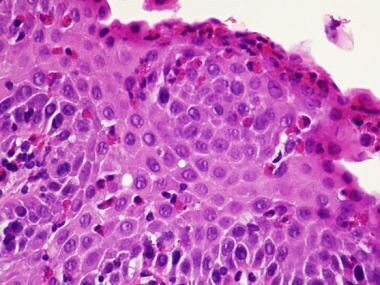 Histopathologic diagnosis of eosinophilic conditions in the gastrointestinal tract. Adv Anat Pathol. 2011 Sep. 18(5):335-48. [Medline]. Genevay M, Rubbia-Brandt L, Rougemont AL. Do eosinophil numbers differentiate eosinophilic esophagitis from gastroesophageal reflux disease?. Arch Pathol Lab Med. 2010 Jun. 134(6):815-25. [Medline]. Antonioli DA, Furuta GT. 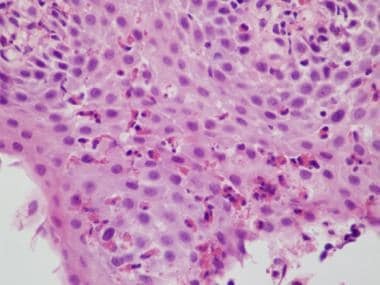 Allergic eosinophilic esophagitis: a primer for pathologists. Semin Diagn Pathol. 2005 Nov. 22(4):266-72. [Medline]. Ireland-Jenkin K, Wu X, Heine RG, Cameron DJ, Catto-Smith AG, Chow CW. Oesophagitis in children: reflux or allergy?. Pathology. 2008 Feb. 40(2):188-95. [Medline]. Mueller S, Aigner T, Neureiter D, Stolte M. Eosinophil infiltration and degranulation in oesophageal mucosa from adult patients with eosinophilic oesophagitis: a retrospective and comparative study on pathological biopsy. J Clin Pathol. 2006 Nov. 59(11):1175-80. [Medline]. Chehade M, Sampson HA, Morotti RA, Magid MS. Esophageal subepithelial fibrosis in children with eosinophilic esophagitis. J Pediatr Gastroenterol Nutr. 2007 Sep. 45(3):319-28. [Medline]. Teitelbaum JE, Fox VL, Twarog FJ, Nurko S, Antonioli D, Gleich G. Eosinophilic esophagitis in children: immunopathological analysis and response to fluticasone propionate. Gastroenterology. 2002 May. 122(5):1216-25. [Medline]. Lucendo AJ, Navarro M, Comas C, Pascual JM, Burgos E, Santamaría L. Immunophenotypic characterization and quantification of the epithelial inflammatory infiltrate in eosinophilic esophagitis through stereology: an analysis of the cellular mechanisms of the disease and the immunologic capacity of the esophagus. Am J Surg Pathol. 2007 Apr. 31(4):598-606. [Medline]. Sawas T, Dhalla S, Sayyar M, Pasricha PJ, Hernaez R. Systematic review with meta-analysis: pharmacological interventions for eosinophilic oesophagitis. Aliment Pharmacol Ther. 2015 May. 41 (9):797-806. [Medline]. Arias A, González-Cervera J, Tenias JM, Lucendo AJ. Efficacy of dietary interventions for inducing histologic remission in patients with eosinophilic esophagitis: a systematic review and meta-analysis. Gastroenterology. 2014 Jun. 146 (7):1639-48. [Medline]. Clayton F, Fang JC, Gleich GJ, Lucendo AJ, Olalla JM, Vinson LA, et al. Eosinophilic esophagitis in adults is associated with IgG4 and not mediated by IgE. Gastroenterology. 2014 Sep. 147 (3):602-9. [Medline]. Lucendo AJ, Arias A, Tenias JM. Relation between eosinophilic esophagitis and oral immunotherapy for food allergy: a systematic review with meta-analysis. Ann Allergy Asthma Immunol. 2014 Dec. 113 (6):624-9. [Medline].